The Superbowl will be here in less than two weeks so it's time to start thinking about my favorite part of football games, the food. We had some friends over this past weekend to watch the Packers game. It was a rough afternoon in our house, but luckily we had delicious snacks to cushion the blow. This Cheesy Garlic Bread was phenomenal! I got the idea from Lauren's Latest and just made a few tweaks based on what I had on hand (and to make it easier on myself). The ingredient list is blissfully short: refrigerated French Bread loaf, butter, garlic, basil, oregano, and cheese, lots of cheese. This Cheesy Garlic Bread is incredibly easy. Pop open a tube of Pillsbury Crusty French Loaf dough, and put it on a parchment lined baking sheet. Use a sharp knife to cut slits about 3/4 of the way down, about an inch apart all along the loaf. Bake it at 350 until it is mostly done and starting to brown (I baked mine for 17 minutes). While your bread is baking grate 1/3 of a lb. of cheese (I used Trader Joe's cheddar gruyere blend but a white cheddar or a Dubliner would be great too). To make the garlic butter, melt 1/3 of a stick of butter in a small dish in the microwave. Add one clove of minced garlic along with some dried basil and oregano. Pull the bread out of the oven and re-slice along all of the slits you made before you baked it. You want the slits nice and deep because that is where you will be putting the garlic butter and cheese. Take that scrumptious garlic butter and brush it inside all of the slits and all over the top of the loaf. Then take the grated cheese and tuck it into all of the slits pushing it down as much as you can. Sprinkle the remainder along the top, no cheese left behind. Put it back in the oven until the cheese is melted, about 5 minutes. Less than 30 minutes to Cheesy Garlic Bread nirvana! 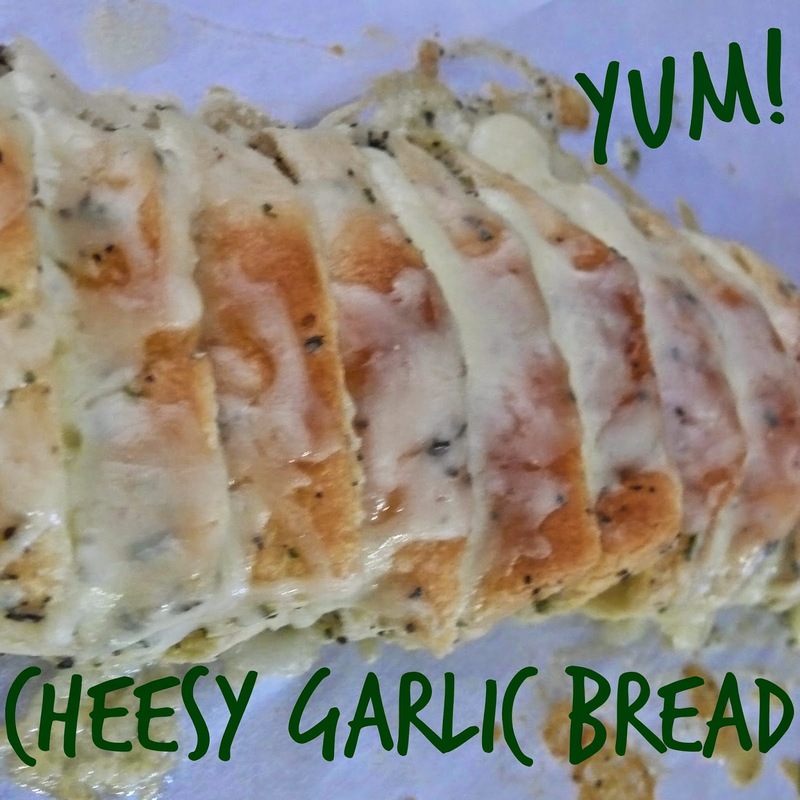 This Cheesy Garlic Bread is the perfect party appetizer for any occasion, but it just screams football food to me. Add this to your Superbowl menu. Your guests will be impressed, your taste buds will thank you, and you can spend your time watching the game instead of working in the kitchen. Open tube of dough and make slits 3/4 of the way down, about 1-inch apart, all along the loaf. Bake until almost done and starting to brown, about 17 minutes. While bread bakes make garlic butter: Melt butter. Mince garlic and add to butter along with oregano and basil. Re-cut all of the slits in the bread. Brush garlic butter into the slits and all along the top of the loaf. Press grated cheese into all of the slits and sprinkle the remainder on top. Return to oven and bake 5 more minutes, until bread is cooked through and cheese is melted. I'm linking up with Tasty Tuesday, Two Cup Tuesday, Whimsy Wednesdays, Wednesday Whatsits, Moonlight & Mason Jars, Create It Thursday, Cook It Craft It Share It, Crafty and Delicious, Showcase Your Talent Thursday, Thrifty Thursday, Creativity Unleashed, Pin Junkie, and Weekend Social, Pinworthy Projects, Best Recipes, Best of the Weekend, Link Party Palooza, Saturday Night Fever, Weekend Potluck, Inspiration Monday, Mix It Up Monday, Craftastic Monday, Busy Monday, and Munching Mondays.